A public inquiry into the £700m redevelopment of Preston city centre is under way. 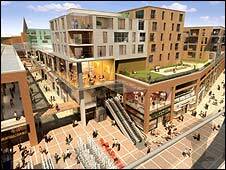 The Tithebarn scheme involves large-scale demolition and the building of shops, restaurants, a cinema, a new bus station and a revamped market. But neighbouring councils Blackburn and Blackpool are opposed to it, claiming it would destroy their economies. The five-week independent inquiry will determine whether planning permission should be granted. Chaired by an independent adjudicator, the inquiry is being held at the University of Central Lancashire and is expected to last about five weeks. Preston City Council is desperate for the development to go ahead, claiming it is "critical" to the future of the city. Council leader Ken Hudson said: "Preston deserves this development - we've been fighting for the development for 12 years now. "It's absolutely essential, not just for Preston, but for the whole of the north west region and central Lancashire in particular. "An independent adjudicator is going to actually see whether Blackpool's figures, Blackburn's figures, our figures for that matter actually stack up and that decision will be made over the next five weeks. "It's going to create 5,000 new jobs. It's not just about retail, this is about the whole revitalisation of Preston city centre and jobs in the north west." Phil Ainsworth, of Blackburn's town centre partnership, said the city's regeneration should not be allowed to affects its neighbours. "Obviously the hope is to allow Preston to develop but not to the size that its is developing," said Mr Ainsworth. "All we are trying to do is protect our own town and make sure people remain within the town centre. "Yes, [allow] Preston to develop a certain amount but not to the size that they are looking at." The council is expecting to learn the outcome of the public inquiry around the end of 2010, when a final decision on the scheme will then be made by government.